The first round of the 2012 NFL Draft is behind us. There are, like, 90 more rounds to go, but why don't we pause to familiarize ourselves with the first-rounders that ended up with New York teams? The Jets picked: Quinton Coples with the sixteenth selection. He is: A defensive end from North Carolina. Why? Well, you can't have too much pass-rushing, and Coples is physically capable of being a great pass rusher. The man is pretty much Human 2.0. At 21 years old, he's 6'6", 284 pounds, and can run faster, jump higher, and hit stuff harder than pretty much everybody else on earth. 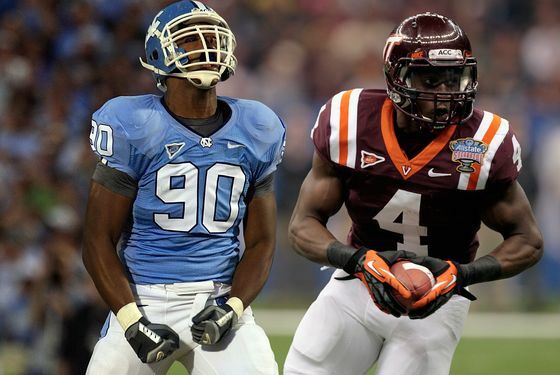 Coples's size and UNC pedigree keep drawing him comparisons to Julius Peppers. That would work. (The Vernon Gholston comparison we keep hearing is not as flattering and centers on "motor" concerns). My approval on this pick depends on the Jets using him as a premium position. Rex Ryan has indicated he will play on the defensive line. I hope that means a position designed to rush the passer like 4-3 defensive end, not a position to tie up blockers like 3-4 end. It would feel like a waste of his athletic skills. I am looking forward to seeing what he can do. Name rating: Very high. "Quinton Coples" is SUCH a football name. There might not be anybody else on the planet with that name. The Giants picked: David Wilson with the 32nd selection. He is: A running back from Virginia Tech. Why? Brandon Jacobs bolted town, and the Giants' depth at running back is a little shaky with Ahmad Bradshaw's feet a perpetual concern. Wilson's a strong, fast little dude. There's also the possibility of him back-flipping the length of the field for a touchdown. The New York Giants might have a "best player available" philosophy in the NFL Draft. Don't ever let general manager Jerry Reese tell you that positional need does not impact the value they put on players and how they set their draft board, however. The selection Thursday night of Virginia Tech running back David Wilson with the 32nd pick of the first round can be viewed as an example that need is more important to Reese than he wants anyone to think. Before the draft Reese said he was "conscious" of what the Giants needs were. Can it be a complete coincidence that when the Giants' turn came the highest-rated player on their draft board was at their position of most obvious need? Probably not. Name rating: Low. "David Wilson" could be anybody: A former British governor of Hong Kong, a former quarterback bust, a ... MURDERER. So, welcome, new guys! Many more to come.